Use Quidco For Free Cash Back & Get £45 FREE! I love finding good deals online which is why I am sharing this Quidco review for all my wonderful readers. One way of squeezing some more money back into my pocket each month is by using Quidco, which means I have more money for treating the kids or putting food on the table. Quidco gives you FREE money for your shopping. Whether it be online or in-store purchases. Since I started using it a couple of years ago I have received over £2000 cash back simply for shopping like I usually do. Whether this be for Christmas presents, birthdays or household items, I receive cash back on items I purchase. There are various other cash back websites out there, but with the easiest dashboard to get around and quick cash back comparisons, Quidco.com is by far the best cash back site! 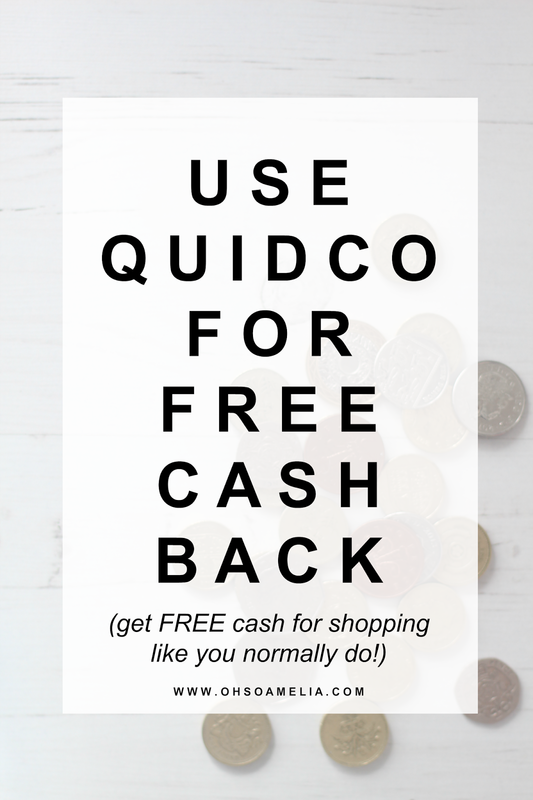 Click here to sign up to Quidco and start earning FREE cash back on your purchases! Perfect timing with Christmas shopping season just around the corner! "Founded in 2005, Quidco has expanded rapidly from its Yorkshire roots to become the UK's leading cashback rewards platform." Last year they helped over 6 million members earn cashback worth over £50 million on their shopping. To find out what percentage you will receive in cash back, all you need to do is look at the percentage number or amount next to the store name while you are on Quido.com. How you earn money is simply by logging into your Quidco account and click on whatever shop or company you are interested in shopping at. 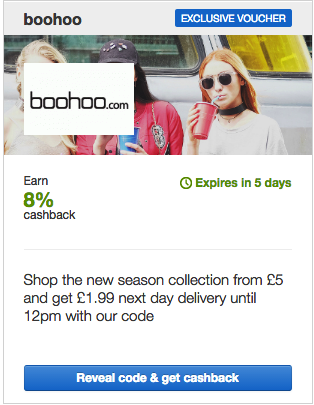 There are plenty of stores where you can earn cash back from, including ASOS, New Look, Groupon, Mothercare, Boohoo, Trainline, Gerorge the list is endless. Then all you have to do is shop like you normally would and you'll earn cash back. Yup, it's as easy as that! Oh and incase you were wondering Quidco is FREE! However you can upgrade to a premium account if you wish. But other than that it's absolutely free to use Quidco! There are many ways to recieve FREE cash back such as signing up to free trials and services or take advantage of great offers where the cash back you earn is higher than what you pay. Click here to find out some great FREE cash back offers where you don't have to spend a penny and can get £45 Free cash back! No, most certainly not! I've been using Quidco consistently for the best part of two years now, I have however been a member since 2010 but didn't take advantage of it and have missed out on hundreds if not £1000's of cash back simply because I couldn't be bothered going through the website. 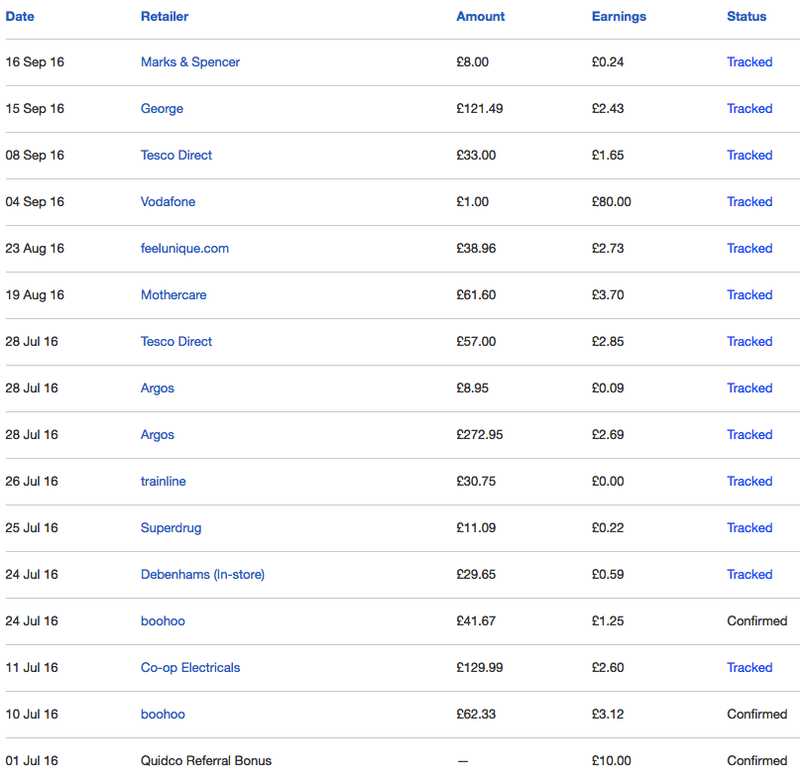 You can see my earnings below to see for yourself just how much you can get in cash back! I am writing this review simply to share with you how easy it is to recieve free cash back for not much work at all. Quido make their money by being an affiliate, which is how they are able to pay people like you and me. They make money through their link whenever you shop on their website. For example: Argos is listed on Quidco.com. Argos pay a percentage to Quidco for being an affiliate and referring customers to them each month. Quidco then gives you a percentage as well for using their website. It's a win win situation and there is no scam involved! Quidco is by far my favourite cash back site and I do use various others as well, however Quidco has always been the easiest to navigate and the one I seem to earn the most cash back from. One tool which has helped increase my cash back earnings this past year is the cashback reminder extension tool for Google Chrome. Since downloading the tool I have increased my cash back earnings by at least 50% as I would always forget to go through the website to get cash back, although I am much better these days as I am trying my best to save money. 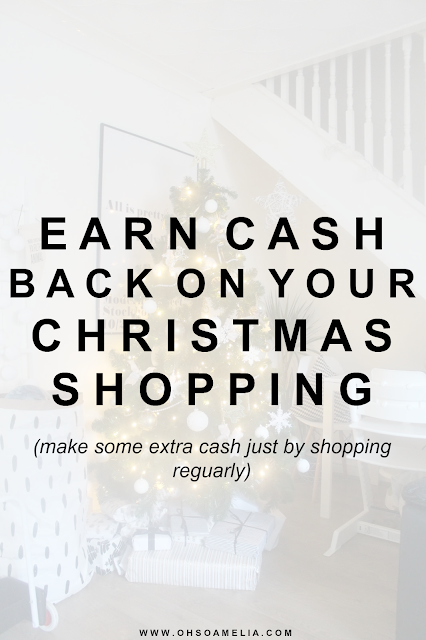 You can get cash back from all of your favourite high street shops as well as get cash back for switching and renewing your car insurance, tv package, and much much more from over 3,500+ retailers! Do you use Quidco as your cash back website? If not what is your favourite cash back website? Let me know below! Sign up for a website like Quidco where you can earn cash back for just spending like you normally would online or instore at one of the many Quidco stores. Plus, if you sign up through my link you will recieve £5 extra completely free! Once you've signed up don't forget to check out these FREE cash back offers to earn yourself over £45 completely free! Want to learn how to earn more money? Check out my post on 10 ways to make money on your lunch break here. If you liked this post feel free to PIN IT below! Quidco is a good site. I've never heard of this before! so awesome. I need to start using this I do so much shopping online! You can make good cashback on mobiles and broadband. Great tips! I've never thought to use Quidco to earn some extra money. Andy loves quidco! He's been using it for a few years! I hadn't heard of before so I will have to check it out. I just started NCP. And am on the fence about the homework part of it. I like the quizzes about consumer issues. I love cashback from Quidco! I have received so much money from Quidco, I love the fact that you get money back on items that you would have normally bought! I really need to start using Quidco - signed up years ago and never really did anything with it. Must get back on it! oooh, I do love cashback websites. I haven't used Quidco though, only one of their main rivals but i may be tempted to switch allegiance? I have not used Quidco. Must look into it! Quidco looks like a good service. I love cashback! I have never used Quidco I use something similar but should really check it out! Quidco is fab. I've been using it for a few years and amassed over £700! Would highly recommend. I got a email about this the last day and signed up. I started with quidco but also use topcashback nowadays. More the latter. Love quidco. Very useful tips. I have used Quidco for large purchases, but often forget for the smaller ones!! I keep kicking myself for forgetting to go through Quidco when shopping online. Must remember in future! I signed up to quidco a couple of Christmases ago as I did all of my Christmas shopping online and someone at work had recommended it. I'm still saving my caahback! i've never used Quidco, i've used TOPCASHBACK! I use Quidco all the time and save the cashback for Christmas, it's really handy! Already use Quidco and I love it. Sounds great I will be using Quidco from now on! A switch on top of the system shuts off the alarm as well as keeps arloproreview language so an individual in the room with the video camera. Time will certainly never be harmed once more. Download here tool to your Windows USB to run Popcorn Time. We will guide right here usps liteblue login or sign up process LiteBlue Login LiteBlue deals with the majority of the staff member's solutions and also demand. We have the ability to highlight our responses the trainee in on student view in their trainee. Official Website The factor why I such as that is since there's likewise a concealed switch.